Material: plastic, and rubber. Package size: 20cm(7.87\")*26cm(10.23\"),rubber fish X 3,fishing rod X 1.Color vary, random delivery. So Much Fun Fir My Little Guys! My 5-year old granddaughter loved it! Kids love it very much! Quality toy which can keep your kids busy for hours. Soooooo cute! Excited for my granddaughter to try it!! So much fun in the tub or splash pool! 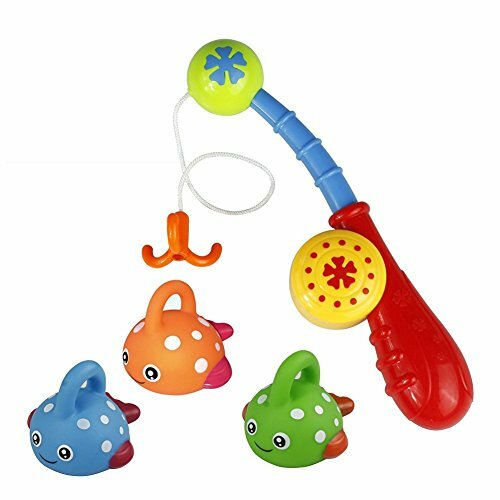 It’s an ok toy for maybe young toddlers (1-2) I thought the fishing line would extend and retract but it does nothing you just hold the pole and latch the fish! !